Do you find your yard being overrun by crabgrass during the warm months? If you’re trying to get rid of this pesky weed without damaging the rest of your lawn, you should definitely invest in a crabgrass killer of some sort. We’ve researched and reviewed a selection of products for this crabgrass killer buying guide so you know what to do to keep your lawn looking great! First, here are some things you should look for. Rainproof: You don’t want to have to reapply the killer every time it rains, as this process often takes a few weeks to get started. Get a killer or preventative formula that won’t wash off with the rain. Formula: This refers to whether the chemical is sold in granular form, or in liquid form. Granules are always waterproof and will often become more effective when it rains. Liquid forms might need to be mixed or sprayed. Application: How are you going to get the killer onto your lawn? Granules need to be used in a spreader or spread by hand. Liquid formulas might need to be mixed and sprayed with a separate device. Coverage Area: If you have a huge lawn, this is going to be most important to you. This is how many square feet that the product will treat when used according to the directions on the label. Package Size: How much are you getting? Larger amounts of product can treat a larger amount of grass to eliminate weeds. This is in pounds for granules, ounces for concentrated liquids, and gallons for formulas that are pre-mixed. Type: When does the product recommend that you apply it? Some poisons are pre-emergent killers that are meant to prevent crabgrass before it happens, while there are some formulas that are meant to kill the root once it’s germinated. Now that you know what you need, let’s take a look at some products! We’ve compiled the best crabgrass killer reviews to bring you products that are effective. We take the guesswork out of choosing the best herbicide for you. Check out our top pick and budget picks first, before perusing the rest of our list. Don’t wait – start the process to get rid of that ugly crabgrass as soon as you possibly can! Let’s get to the reviews! 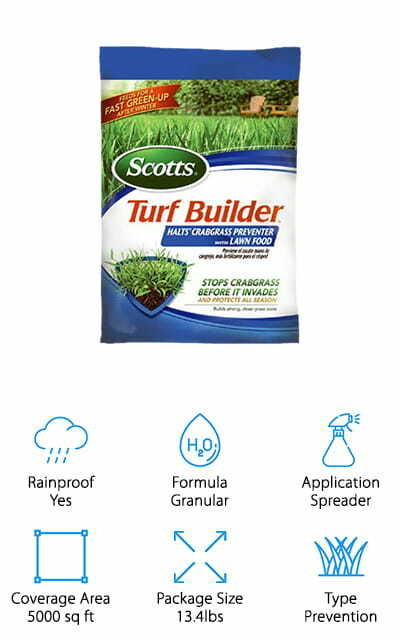 Scotts Turf Builder Halts is the best crabgrass killer for sale that we found. It’s a preventative formula that is meant to stop crabgrass before it even starts growing. If you apply this formula in the early springtime, it will prevent most broadleaf weeds, including that pesky crabgrass! For best results, water your lawn first, then spread the granules. Do this 2 to 3 days in advance of a light rainstorm to help the granules permeate the soil and get the weeds at the root. It’s also a lawn food, so while you’re poisoning the crabgrass, you’re making sure that your lawn is healthy and growing! This product won’t be ruined with rain, snow, or even freezing temperatures. It’s also meant to last all season with one application. 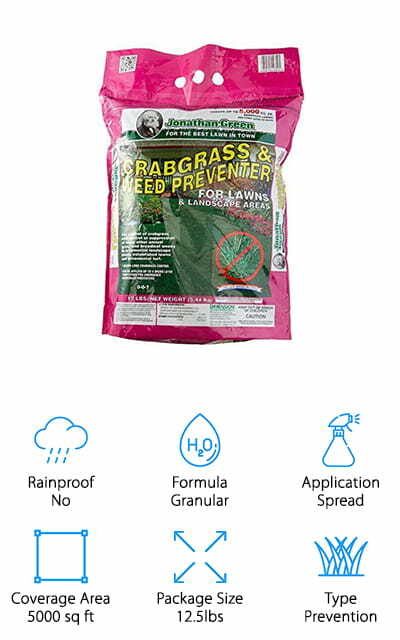 Get your lawn growing and your crabgrass gone with this effective product that will help your lawn look great. This herbicide works without any additional steps! Our budget pick is the Bayer Advanced Crabgrass Killer spray. It’s concentrated, which means that it will need to be mixed with water according to the directions. If you mix it as directed, you will get the perfect mixture to kill lawn weeds, crabgrass, and 200 other varieties of broadleaf weeds. If you apply it to your lawn as directed, it won’t harm the rest of your grass. We think that’s pretty awesome. After you spray the weeds, the poison is rainproof after it dries, which takes about one hour in regular conditions. 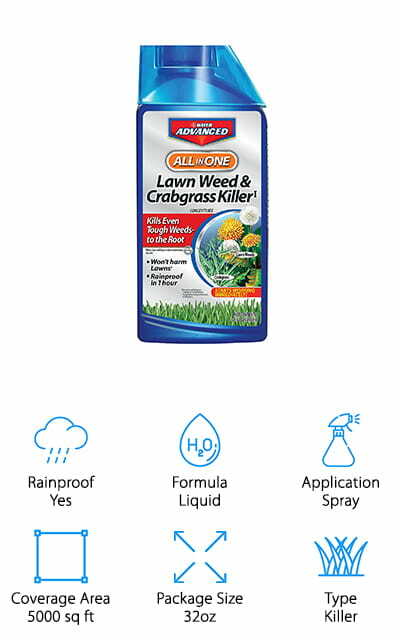 This formula by Bayer is one of the best cheap crabgrass killers that we found during our research because it doesn’t take that long to work and this little bottle covers an impressive 5,000 square feet of lawn. That’s crazy! And after you spray, you can begin mowing in just about 1-2 days. It’ll already be affecting the weeds’ roots at that point! Spectracide is one of the best-working brands that you can get on a budget. This spray is concentrated, but it’s already ready to spray. It has a special, unique nozzle where you attach the hose to the back opening. When you turn the hose on, the formula mixes in the nozzle so you don’t have to mix it in a separate sprayer – which can get costly. Instead, you simply spray from there and you get the perfect amount of poison vs water. This nozzle really takes the guesswork out of spraying your lawn! There are visible results just eight hours after you spray, and we think that’s pretty amazing! It even kills the almost-immortal yellow nutsedge, as well as 250 other types of weeds. It even gets dandelions! It won’t harm the rest of your lawn, either. Our guide just wouldn’t be complete without a Spectracide crabgrass killer review. For best results, apply during temperatures between 45 and 90 degrees! 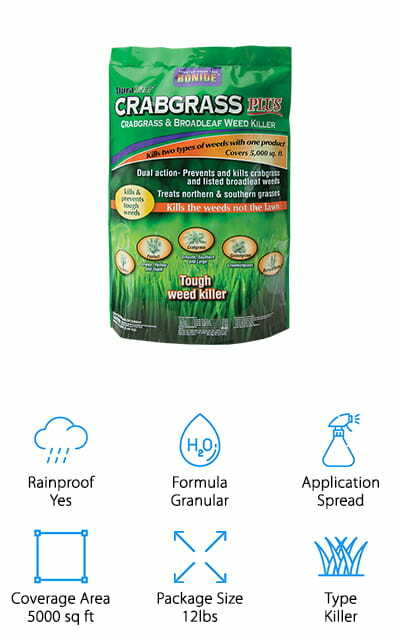 This weed-prevention granule formula from Safer Weed is completely natural! It’s made of corn gluten, and that’s the only ingredient! That’s pretty impressive. It also boasts up to 90-percent weed control just on the first year, on weeds like dandelions as well as crabgrass. The granules allow for the herbicide to be distributed uniformly across your lawn, especially when using a spreader device. It’s easy to use, as is effective if used in the pre-emergent period. Let it kill the weeds before they sprout! You can get rid of the problem before it starts with a formula like this one. Corn gluten is a by-product of manufacturing corn starch. It won’t burn, smell, or harm your other lawn. Use it in flower gardens and vegetable patches! It’s so gentle on non-weeds that it’s the best crabgrass killer for Bermuda grass. It won’t discolor it at all! This 5.4-pound bag will cover an area of 2500 square feet of lawn. 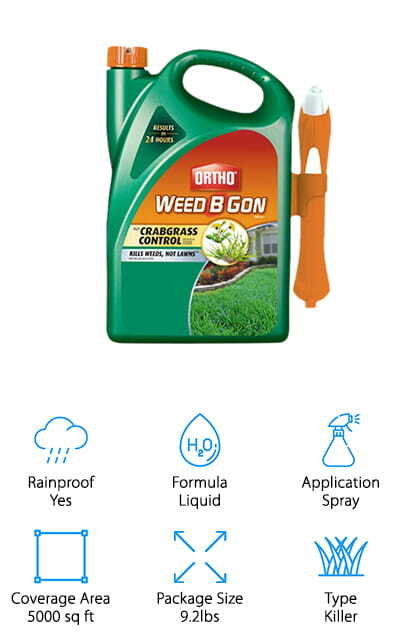 Ortho is known for making excellent herbicides and pesticides, and this Weed B Gon formula is definitely not an exception! 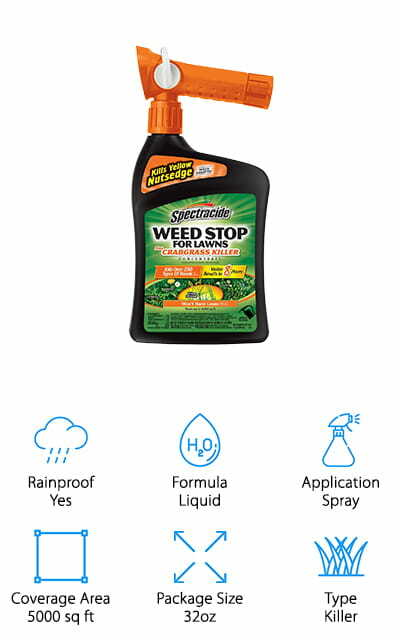 It’s a gallon of liquid formula that isn’t concentrated, so it’s ready to spray right onto your pesky weeds, no matter how overgrown they are! Just this container covers 5000 square feet of lawn, and it won’t damage your regular grass at all. It kills crabgrass, dandelions, and a lot of other common weeds right down to the root, so they won’t come back! The applicator is a trigger, so you can direct exactly where you want the poison to get the most weed coverage. It’s definitely a candidate for the best liquid crabgrass killer because it begins working in hours, which means that it begins working immediately upon application to make your lawn look great! Get more with this product, because the Ortho name is trusted in getting rid of all manner of nasty pests! Spectracide Crabgrass Granules work to prevent crabgrass and 200 other types of broadleaf weeds. This includes chickweed, clover, and dandelion. It prevents other types of annual grasses that you don’t want in your lawn as well. For best results, apply while the weeds are going. One application can protect your lawn for up to five months of weed control. It won’t harm your lawn, either, which means that you get to keep the grass you want and get rid of the grass you don’t. This one 10-pound package of granules will cover almost 3,000 square feet of your lawn. If you have a smaller lawn, you can even use this product for multiple treatments if your weed prevention technique needs a little boost. Even the most stubborn weeds don’t stand a chance against the best selective crabgrass killer! As we saw before, Spectracide is a great, well-trusted brand that is affordable and effective at preventing all types of pests! Green Light Wipe-Out is an extremely tough formula that takes out crabgrass and 250 other species of weeds out right at the root. Most of the weeds it prevents are broadleaf weeds, including chickweed, foxtail, clover, and even those pesky dandelions. The formula doesn’t kill your lawn, either, so it only gets rid of the weeds you don’t want. It starts to work immediately on contact – that’s powerful! Wipe out all of the weeds that you don’t want hanging around in your grass. This 32-ounce package is concentrated, so it will need to be mixed with water in order to be effective and leave your lawn intact. Even this small amount covers about 6,400 square feet of your lawn. Smaller lawns can use this multiple times during the season to keep weeds from bothering you.It includes a lot of proven-to-work active ingredients that are sure to kill your unwanted plants as soon as they hit the root. BONIDE makes one of the best rated crabgrass killers that we found on our list. It’s super effective at getting rid of crabgrass and other broadleaf weeds really quickly, so you can spot-treat your lawn without harming the turf grass that you want to flourish. Because it doesn’t contain any fertilizer, many people say that this killer works better than other brands for them. 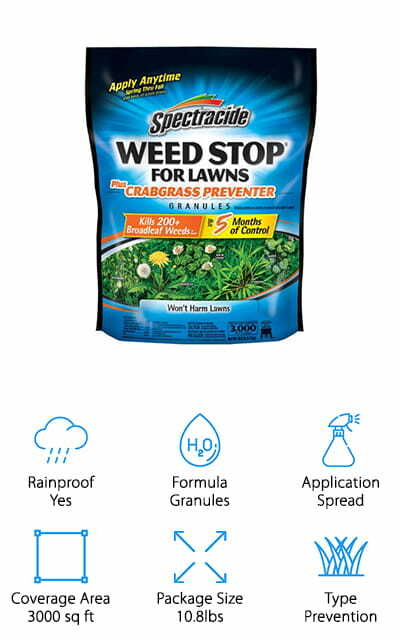 If your weeds are particularly stubborn, this might be just the product that you need! It’s ready to use and not concentrated, so you don’t need to do any heavy-duty mixing. 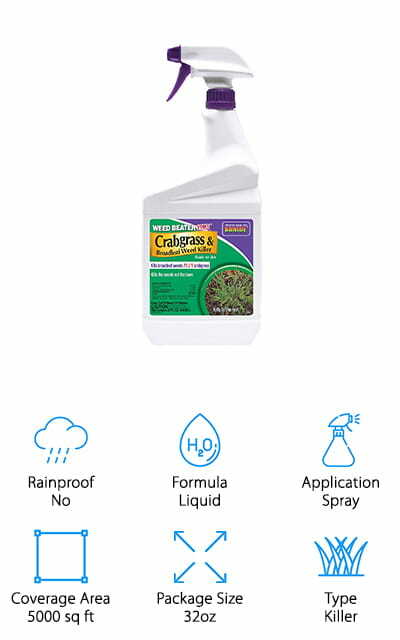 It works to kill the crabgrass and other weeds after they germinate – so you have to already see them for this product to work. But once it does, it works well. The smaller size of this product makes it perfect for spot treatment when you have trouble areas but don’t really want to treat your whole lawn. Because it’s not a preventative treatment, it’s perfect! It might not be a very well-known brand, but that doesn’t mean that Jonathan Green Crabgrass Prevention granules are any less effective. Use them in spring before everything starts blooming or germinating. It works best when used in fully-established grass and lawns, with grass that is passed the seedling stage. This 12.5-pound bag will cover a lawn that is 5,000 square feet in size. It is ideal even for landscaping areas because it won’t harm your other plants – it only works on broadleaf weeds and crabgrass. In fact, it is the best pre-emergent crabgrass killer that we found to work even on flower gardens. This preventative treatment will control your weeds all season long – so you only need to apply it once. It also prevents any other unwanted annual grasses – while protecting your lawn and keeping your existing grass and ornamental plants looking great! We love this formula, and the effectiveness really can’t be beaten. This BONIDE Crabgrass Weed Killer prevents and kills crabgrass, as well as several varieties of other broadleaf weeds. You can use it to treat both northern and southern kinds of grass without any repercussions, as it only works on the weeds and not your grass. It kills these weeds at several different stages of development, to get the weeds no matter how old they are. 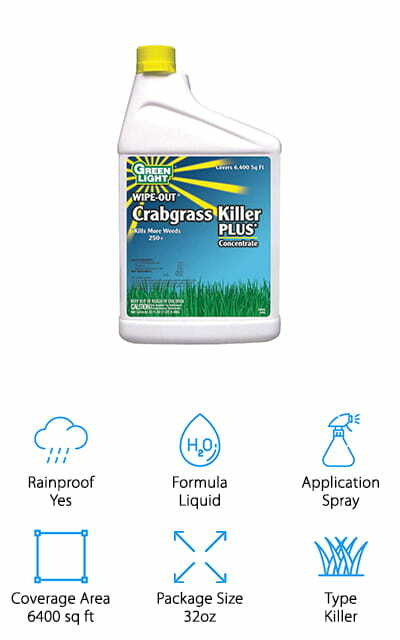 It’s formulated specifically to help you control even mature crabgrass. Worried about getting your lawn treated early in the season? You don’t have to anymore! This killer will make it easy. It is a lightweight formula that helps it stick to the leaves and make its way to the root s- where it wither them. It’s one of the best crabgrass killers for lawns. It’s worth noting that it doesn’t work on Centipede or St Augustine grass, as it will adversely affect them. 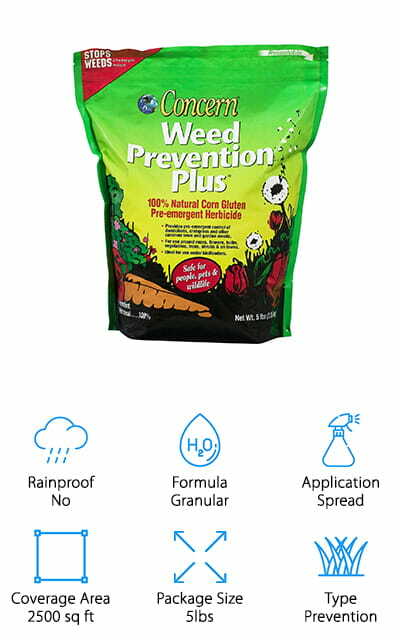 Take the guesswork out of preventing and killing your weeds with this formula!